Try this easy Thai noodle recipe made with fresh herbs. It's quick and simple to make, and super-tasty! Good both for the vegetarian Thai food lover, or just add shrimp for those who like seafood. Excellent for both lunch and supper, you'll want to make this noodle recipe part of your everyday Thai food menu. Heat up a wok or large frying pan for 1 minute (medium-high heat). Add oil and swirl around. If Not Adding Prawns or Tofu, Skip stepping 7. Add 1/2 the paste plus the prawns or tofu. Also, add 2 tablespoons white wine or cooking wine (or broth). Stir-fry for 1-2 minutes until shrimp are pink and plump, or tofu is warmed through and fragrant. (If wok or pan becomes dry, add another tablespoon or two of wine or broth.) Now clear a space in the center of the wok or pan. Break egg into wok or pan and quickly stir with a spatula until egg is cooked (like scrambled eggs). Push eggs and other ingredients aside and add 1 more tablespoon oil to the bottom of the wok or pan. Now add the noodles plus all the [remaining] paste and stir fry one minute, or until noodles are cooked. Do a taste test. If not salty enough, add more fish sauce or vegetarian substitute (I usually add at least 1 more tablespoon, but it may already be salty enough for you). If not spicy enough, add more fresh chili, or a little chili sauce and toss well to incorporate. Remove wok from heat. 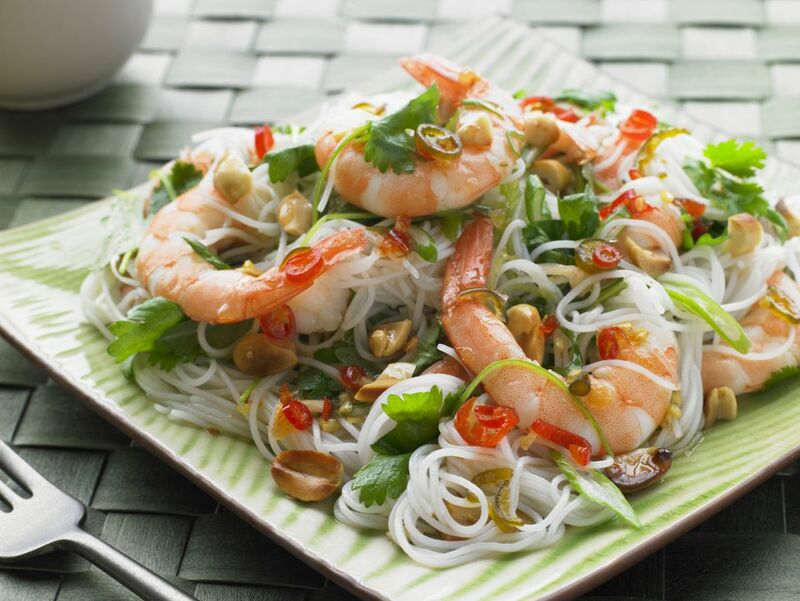 Toss with fresh herbs and bean sprouts (if using). Sprinkle noodles with the ground or chopped peanuts. If desired, place wedges of fresh lime on the side (optional). For those who like their noodles extra spicy, accompany this dish with a bottle of Thai chili sauce. ENJOY!